Still, this is better than the other stream. Have Eurogamer got anything going on? I'ma have a look. THOSE ARE TERRIBLE BEARDS, I WAS PROMISED DREAMS AND HYPE, NOT TERRIBLE NOT EVEN HIPSTER BEARDS!!! 15 minutes of beards and counting. 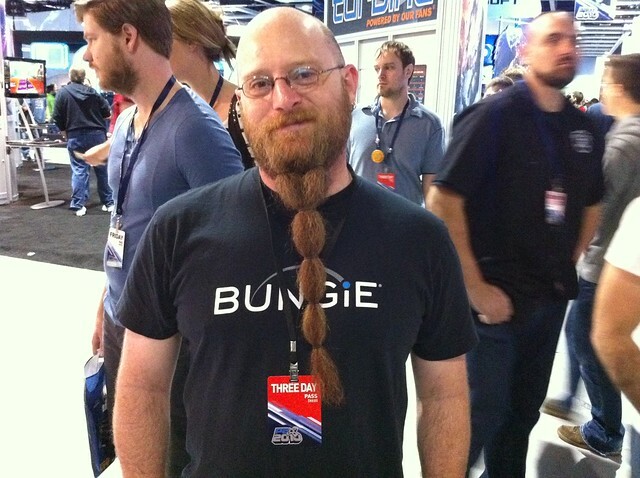 Isn't there that Bungie guy with a mega-beard? Maybe this is some kind of viral? I don't mind AAs as a concept. If he came up with Armour Lock then he should probably be throttled with his own beard. In case you're wondering, I'm quite excited. More details pouring out of beards. Tiny bits of game play and in game stuff, mainly story but in general..WHERE CAN I ORDER THIS? Bungie get my money by default. Also, screw the beards, info is here. Watched that. So it's halo. Looks like there's slightly more to it than that. Staten scores a new pistol. Like the Huntressâ€™s sidearm, it too has a custom name: â€œThorn,â€ a fitting description for a 45-caliber hand cannon. Halo but on different worlds and online. Based on that FAQ, it sounds more like a cross between Halo and something like WoW. Persistent world, meeting up with people to do quests, the word 'raid' was bandied around a fair bit. Definitely seems different from the SP/Campaign in co-op/MP split that Halo offers. I would've been interested if it wasn't more space nonsense. Ah well, keep sticking with the same old same old Bungie. Set in space does not equal 'same as halo' for me. Will need more details before that can be claimed.